Stitched Together: What? Is it Friday Already?? What? Is it Friday Already?? Well apparently this week sped up significantly towards the end of it. I'm sure it is only Tuesday or something. Must be the drugs....now why am I here? Oh yes, crafting!! It was a Christmas present for my mother in law. It was hard to give it up because I loved it so much, but the look on her face made my separation anxiety disappear. Then I went back to visit Artist's Palette, where I got the original yarn and they had this yarn in the sale section, just in a slightly different shade. The yarn is discontinued and is called Gleam Lite. 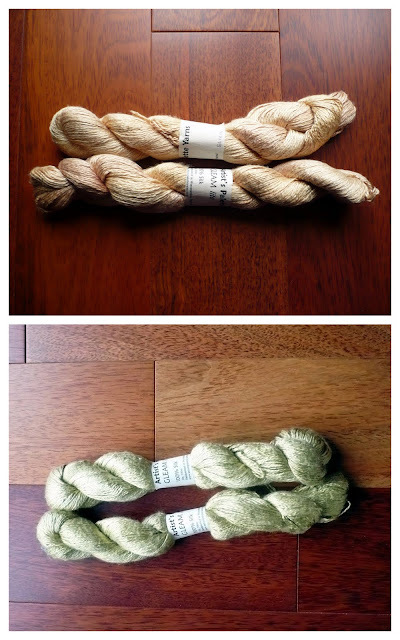 The top yarn was used for the original shawl. The bottom yarn was the yarn I got for myself. I simply duplicated everything about the first project, casting on 68 stitches and using a 3.5mm needle. As before, I used the Wakefield Scarf pattern, which is free from Interweave. The only thing I would recommend with this pattern is keeping track of which line of the 12 row lace repeat you are on. The pattern is so simple it is easy to get lost, as the only differences are at the beginning and ends of the rows. The results of this repeated endeavour are as wonderful as the original. The drape of this gorgeous pure silk yarn is just fabulous. I think my gauge has changed since the first one, or maybe I just blocked the shawl harder this time. I think that the shawl is wider and the pattern more visible. I think it must have been just a harder block. Because this is larger, this shawl will be useful to take on holiday as it will fold up small but offer some form of warmth on a cooler evening. It will also be useful as a scarf on occasions in the Winter when I want to dress up a bit. I am really happy to have my own version of this scarf. I can imagine knitting it again in the future, but with different yarn next time! I am hooking up to my usual Friday linky parties. Please click on at least one of the buttons listed below and check out some different crafters and bloggers. They are really worth a look.